1. Preheat oven to 350 degrees and grease a bundt pan with butter very well. 2. Make the batter: In a medium bowl, combine flour, baking powder, and baking soda. Stir in sour cream. 3. In a bowl of an electric mixer, beat butter, white sugar, eggs, and vanilla. Slowly incorporate flour mixture into sugar mix. 4. 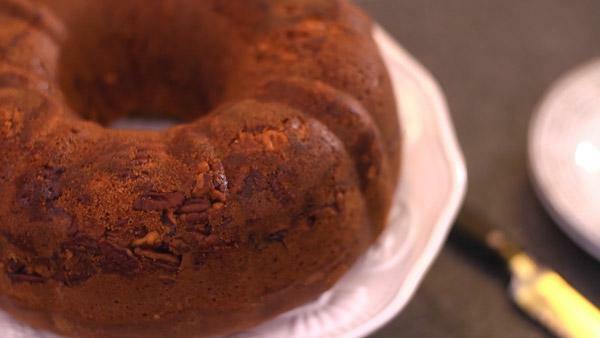 Make the topping: In a small bowl, combine nuts, sugar, flour, cinnamon. 5. Sprinkle topping at the bottom of the bundt pan, layer with half of the batter, the rest of the topping, then the rest of the batter. 6. Bake for 1 hour. Let cool in pan for 10 minutes, then invert and let cool on wire rack.